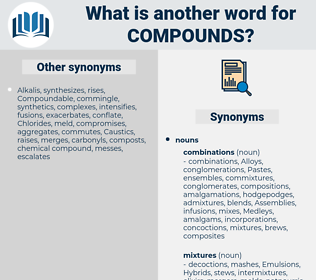 What is another word for compounds? produced, produce, o, commodity, Commodities, proceeds, produits, Generated, outputs, assessment, deliverables, parks, revenues, canada, S, goods. communications, Communities, Concentrations, bonds, considerations, molecules, accommodations, by-products, contributors, contaminants, medications, VOCS, neighbourhoods, contents, organic, organics, Antibiotics, Neighborhoods, Complexities, Foundations, lactones, outcomes, contacts, pollutants, factors, pollution, blends, derivatives, Prisons, cores, cooperatives, connections, agglomerations, interconnections, precincts, locations, consists, quarters, groupings, relationships, dispositions, structures, campuses, organisations, outposts, mixtures, elements, rooms, partnerships, volatiles, environment, ingredients, Pesticides, Organizations, sites, deployments, Drugs, stimulants, blocks, Associations, coveralls, clusters, Medicines, compromises, topics, amenities, PAHs, groups, installations, fractions, allowances, districts, centres, establishments, formations, pieces, additives, objects, sections, Forums, Fora, pools, unions, estates, Properties, zones, clubs, pillars, wards, links, Stations, roads, aspects, packages, routes, crops, inputs, grantors, crowds, blocs, cars, franchises, salts, Populations, relations, immovables, bridges, segments, ensembles, tenders, variants, subjects, servants, officials, mixes, forces, gatherings, Ods, mixing, offices, parts, Societies, Bodies, nutrients, trade-offs, tenures, Assemblies, networks, spaces, supplies, linkages, themes, places, sets, Rallies, caucuses, FACETS, vessels, licences, leases, items, effluent, effluents, suits, installs, Ships, sides, Rats, kits, Grants, claims, POPS, crates, Foods, Ones, members, registers, ties, officers, features, Commodities, proceeds, produits, LINEs, Vehicles, outputs, assessment, deliverables, parks, revenues, S, composed, goods. underscores, produces, complicates, contributes, comprises, double, doubles, constituents, develops, preferably, strengthens, accentuates, enhances, deepens, improves, inhibits, increases, burdens, point, points, worsens, emphasizes, intensifies, submits, emphasises, official, heightens, grows, aggravates, escalates, adds, amplifies, prepares, consists, argues, fix, boosts, highlights, PAVES, rises, says, raises, supplies, sets, makes, proceeds, produits, outputs. product, products, vehicle, Vehicles, composed, compounding, composite, composites. complex, complexes, combinations, constituents, compositions, phytochemicals, chemicals, CAMPS, premises, concessions, preparations, carbons, buildings, Facilities, Plants, venues, species, Towers, halls, materials, agents, feeds, cabinets, products, composites. 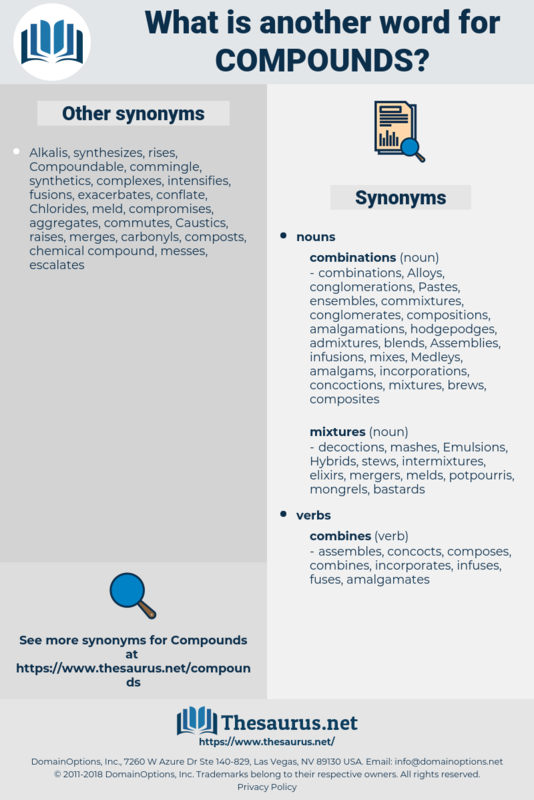 components, reinforces, product, products, goods. These compounds are similar, because the atoms of which they are composed are arranged in the same manner. The superiority of the French mustard comes from the compounds used, and not from the way it is made, as thought by many.